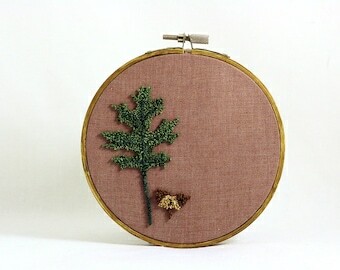 Here's a Quaking Aspen Leaf and Seed Pod, my punchneedle take on a representation of old school botanical plates. 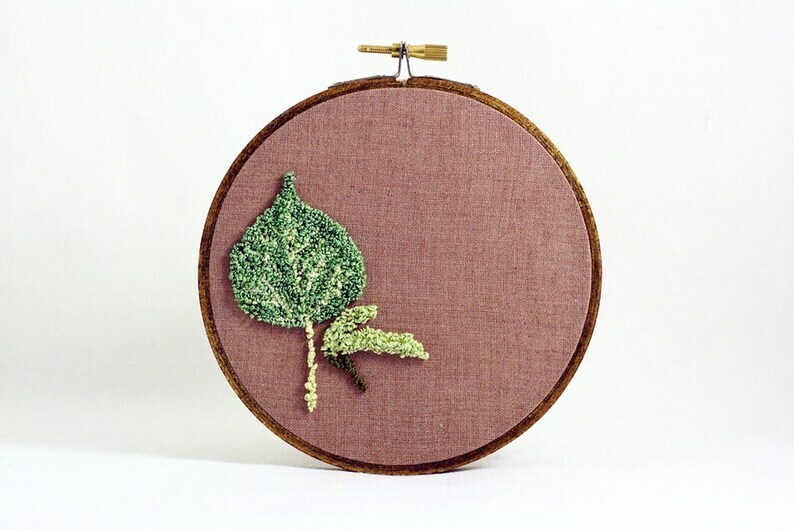 I drew up this leaf and seed on brown weaver's cloth that my husband and I hand dyed, punched it out with hand-dyed embroidery floss, and permanently attached to a 5 inch (12.7 cm) decorative hoop that we stained. A 5 inch circle of eco-felt is attached to the back. 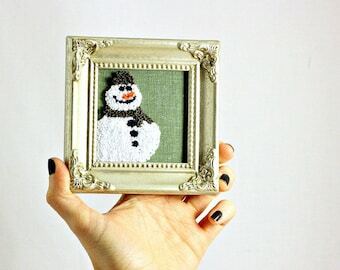 It was created using the punchneedle embroidery technique, which is akin to an ancient rug hooking technique on a smaller scale. The finest high end hand dyed floss was used in this design for depth. Ready to ship and arrives in pretty eco-friendly packaging all set for gift giving, and comes with a small brass nail for hanging. Some elements may vary slightly depending upon availability of products needed to create the art. Each one is hand drawn (no pattern) so please allow for subtle differences. I endeavor to stick as closely to original as possible but sometimes thread shades will vary slightly - as most are hand dyed. The weaver's cloth is also hand dyed and though the same brand and color dye will be used as the original to dye the weaver's cloth, shades may vary slightly from the original pictured depending on your computer screen and dye lot. 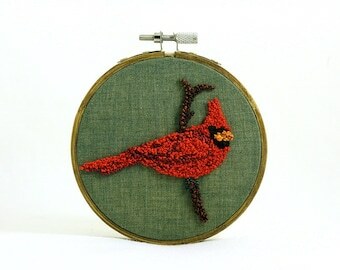 Bunny Rabbit Punch Needle Embroidery Hoop Art. 5 Inch Hoop. Brown, Tan, Natural Colors. Eco Friendly Neutral Home or Cottage Decor. It’s a cute little bunioned foot! This is soooo cute! Silhouette of Greenpoint Brooklyn. 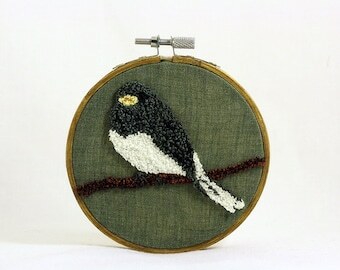 Embroidery Hoop Wall Hanging, 5 inch hoop, New York City, 5 Boroughs, Black and White.